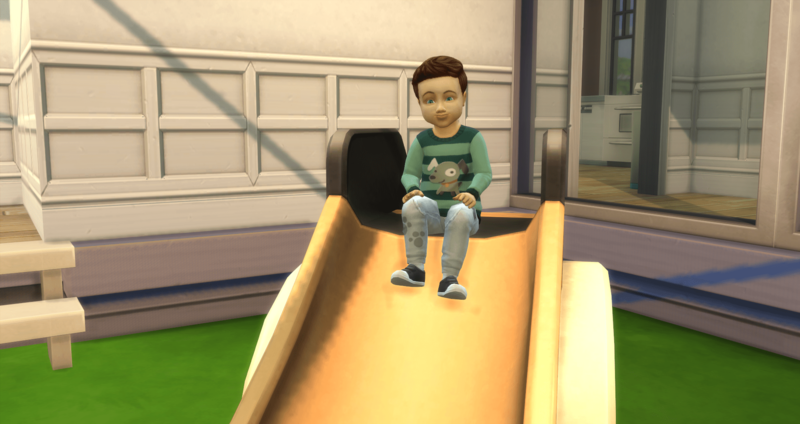 The kids can be found on the gallery once they move out. They can be found under #boolpropnet and #grace100 or under my EA user ID tsmetana or under their individual name. 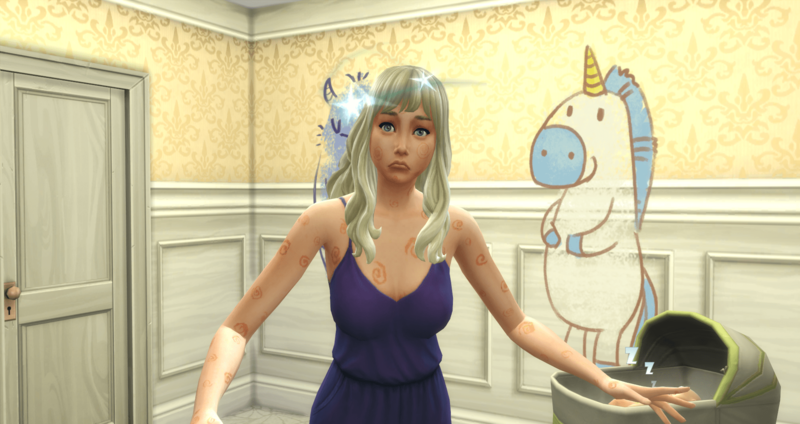 Merry can also be found on the gallery as Merry Grace or under my EA user ID or under #WonderChild and #boolprop. I use both hashtags (boolprop and boolpropnet) inconsistently, apparently. Miami wandered into the nursery and met her new siblings. She is pissed. Merry looks nervous. The vagaries of a toddler… Vienna asked Merry to read a book, it dropped out of Merry’s queue, so I added it back. Merry said, let’s read a book. Vienna melted down. Austin was needing to have some fun so he invited Katrina over. They didn’t waste any time getting to the fun. Of course, he has Merry as a role model. Although from that picture, it sure looks like Katrina was the initiator. Pleasant Fumblings: There’s nothing quite like fooling around with your girlfriend. 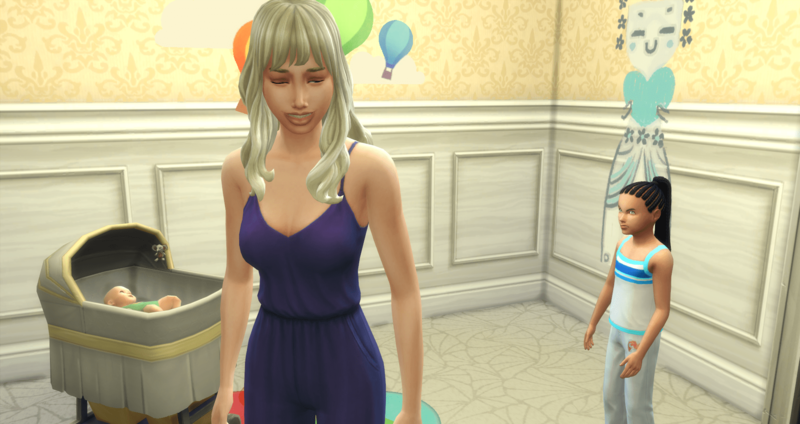 So I thought about giving Merry a break between kids, but then I decided to make it 10 pregnancies and then a break. So she invited Sergio and this will be the 10th. 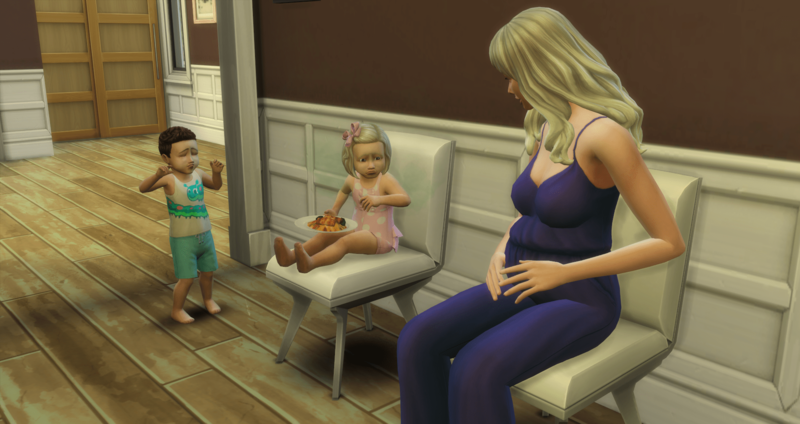 With two sets of twins, that gives her 12 kids so far. Sergio rejects her advance. He tells her he is not just a plaything, there for her amusement, at her beck and call. He was very angry. However, Merry has her ways of getting what she wants. And it didn’t take long to get him into the closet. After which, she just-friended him. Don’t call me, I’ll call you. Fussbutt has reached the end of her day and she wants to go to bed. But things can’t be that easy. 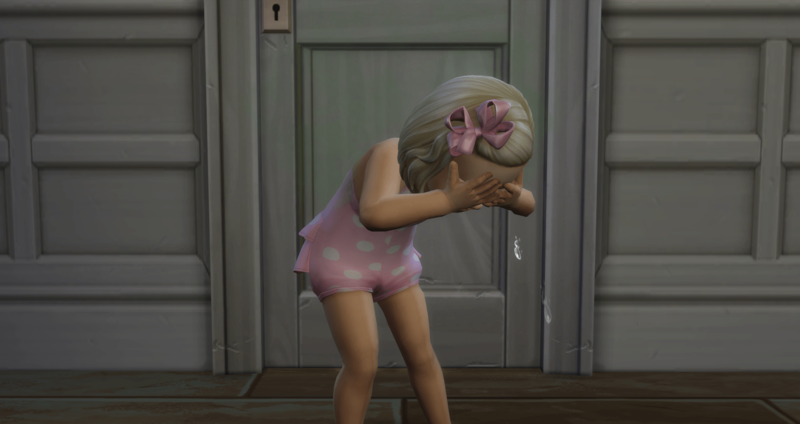 She started crying so Austin checked on her. 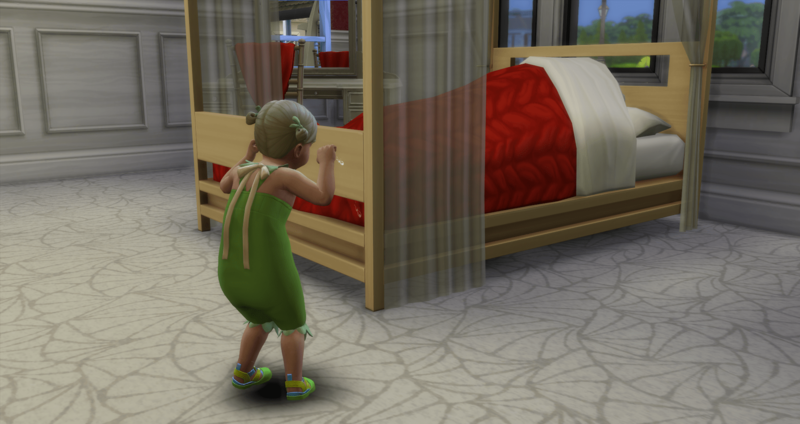 She said she wanted to go to bed, so he queued the action to take her to bed, and then she threw the tantrum. 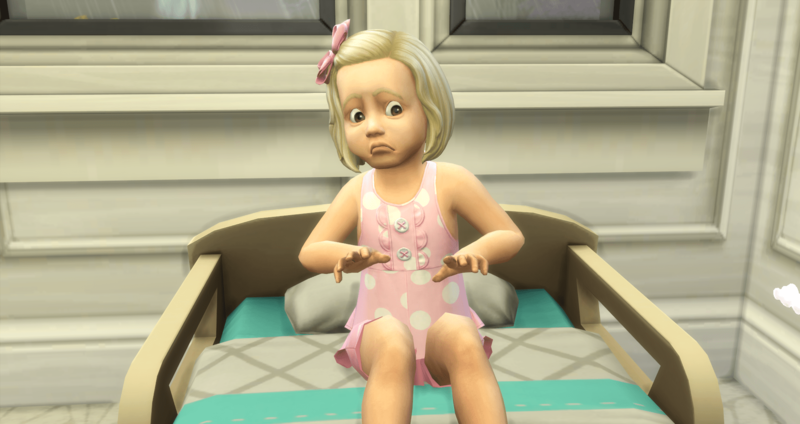 Now he is waiting for her to finish her tantrum so he can take her to bed. While he is waiting, Merry comes over to see what is going on. The thing is – she was not exhausted when this started. She was just a little bit tired. 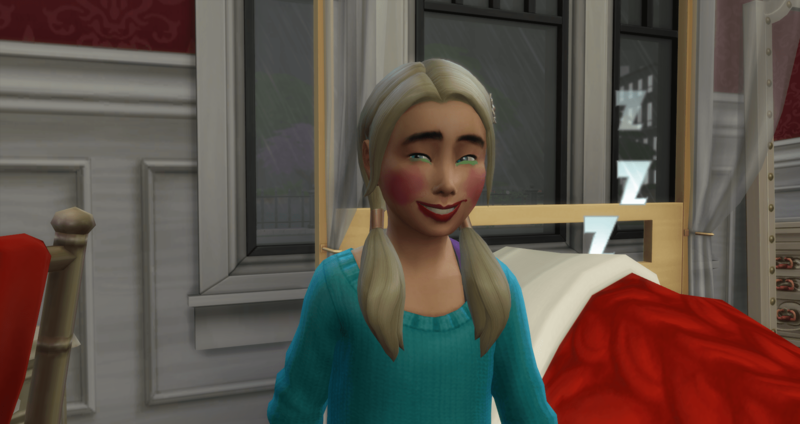 Okay, now you can judge her. She made a Silent Film and then a Granny Smash. 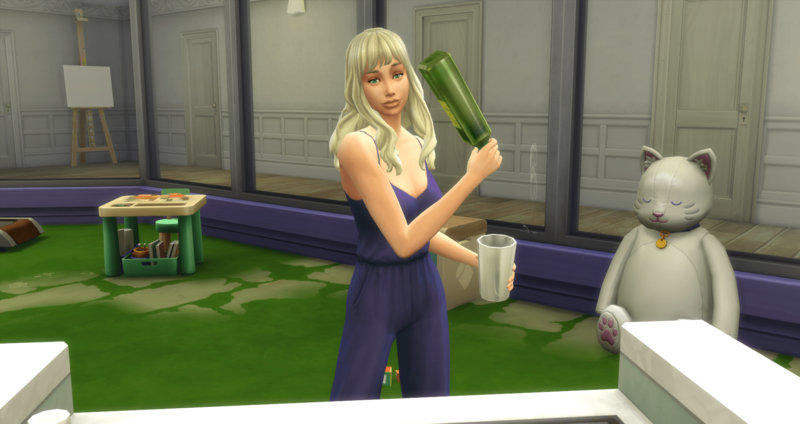 I thought it was going to be a case where she just made a few drinks and left them all sitting on the bar. 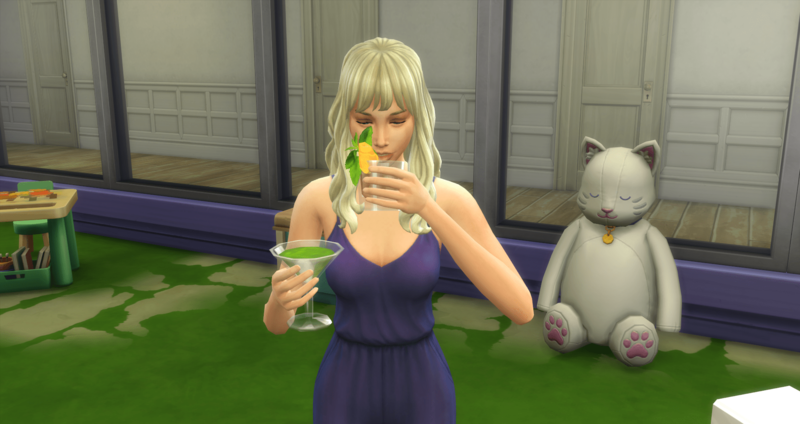 But then she picked up both drinks, and drank them both. Victor Feng (Vienna) is the first of the baby daddies to die. Followed almost immediately by Thiago Ibarra (Tahiti). The picture has nothing to do with the deaths, just a random picture of Merry, dizzy with a disease. 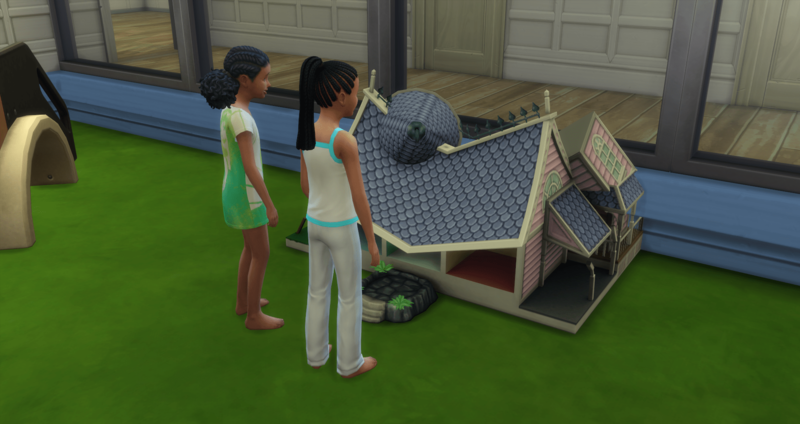 I missed the broken dollhouse so I am not sure who destroyed it. 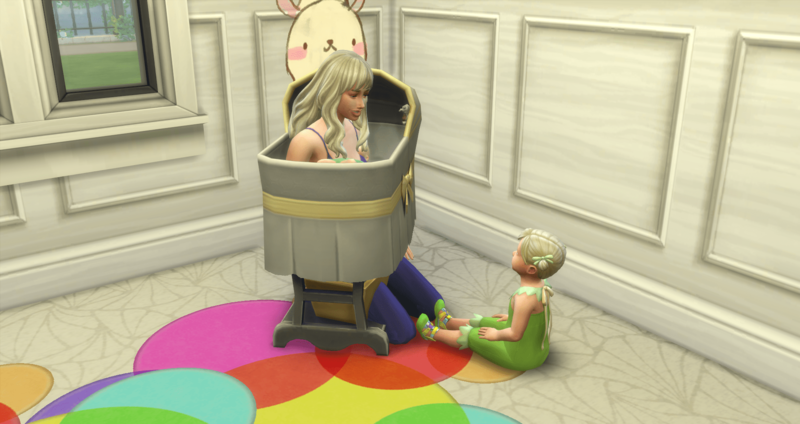 I didn’t get Merry over to repair it because I had let Fussbutt sleep through the night, which meant she getting a bath due to a loaded diaper. 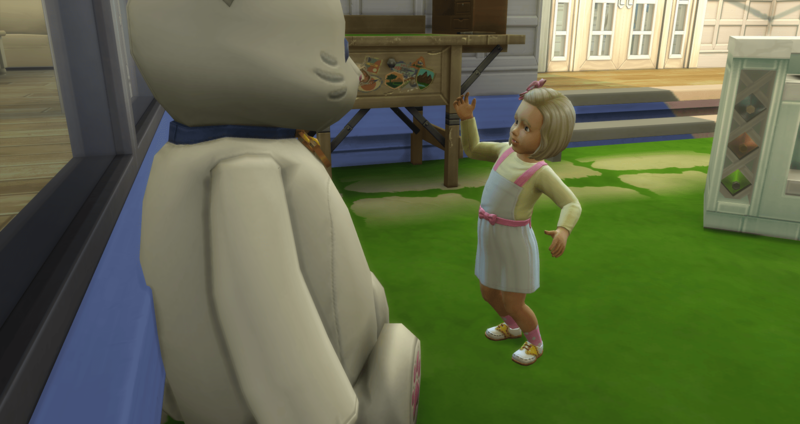 I could hear someone boohooin and I found these two. They must have been done crying because then they just stood there and would keep giving each other looks with, I swear, evil grins. I do not trust these two. This is just awkward. Merry is in the bassinet with Rushmore. I have no idea what this is about. My interpretation is that she is trying to talk to Rushmore but he isn’t talking back. Fussbutt is trying so hard to be a big girl but everything is just so hard. 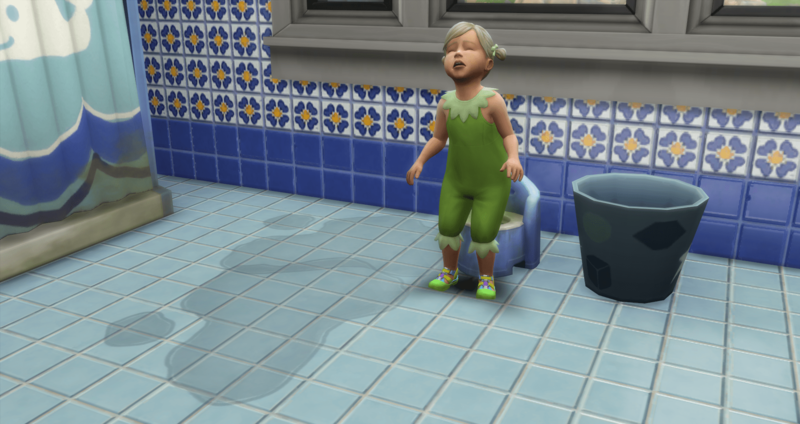 She tried so hard to use the potty the right way but she still peed all over the floor. She wakes Merry up from a perfectly lovely nap for some comforting. But when Merry offers it, she rejects it. 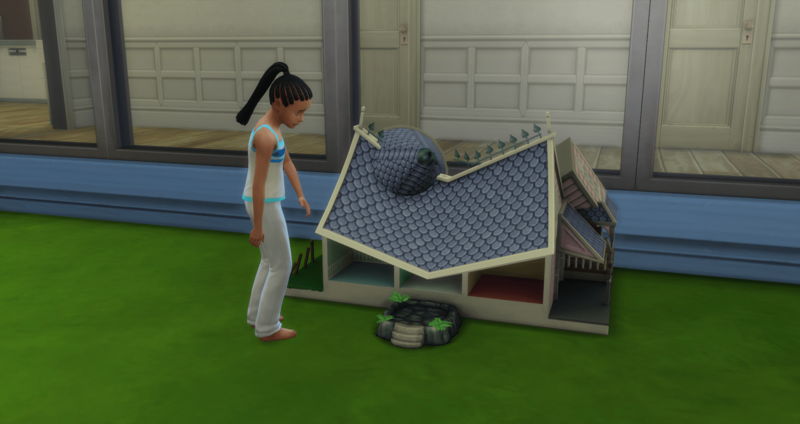 Merry leaves her to her pouting and heads out to get the mail, pay the bills, and authenticate another artifact. The kids had a good day at school. 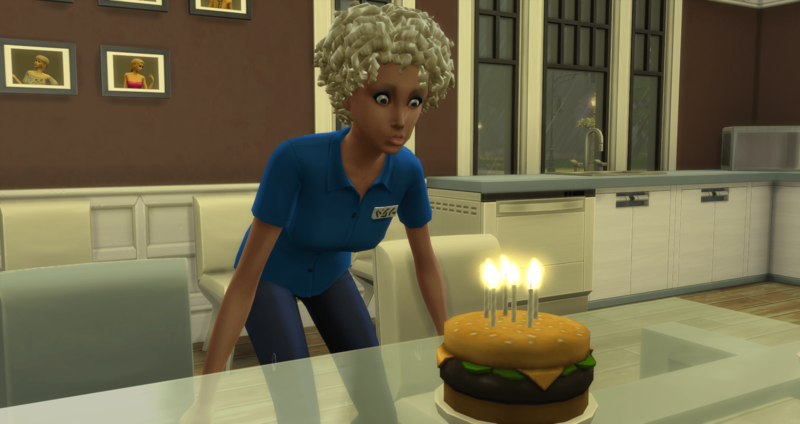 Austin gets an A – but he doesn’t get a birthday because he still needs to get a promotion. Miami gets an A, and a birthday. Mecca gets an A, and a birthday. I am not sure why her fists are clenched. She came home happy. Austin is a good kid. He is probably the reason Fussbutt’s thinking skill is higher than I realized. 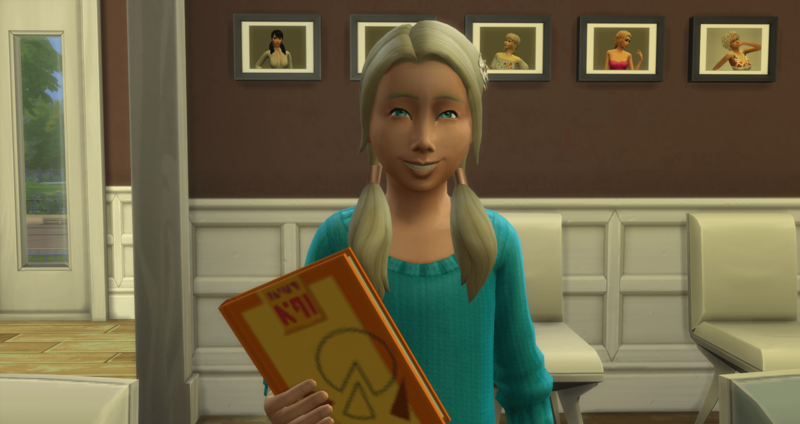 She is almost to level 3 where most of my toddlers would barely be level 1 at this point. 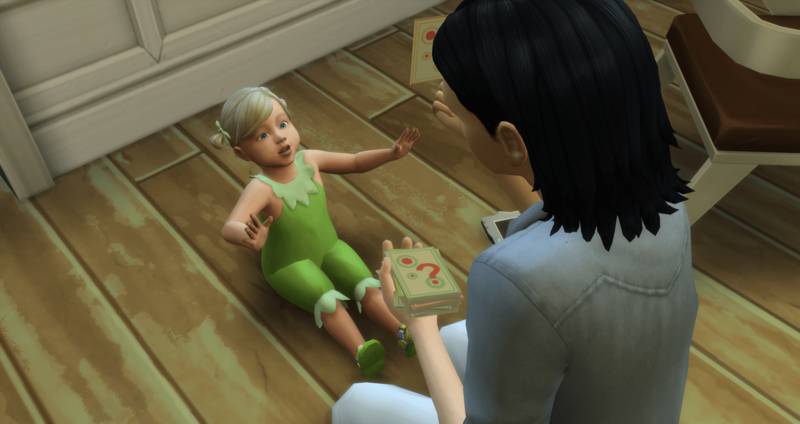 Every time I lost track of her, she was with him and the flashcards. He is working with her again, and she reaches level 3. 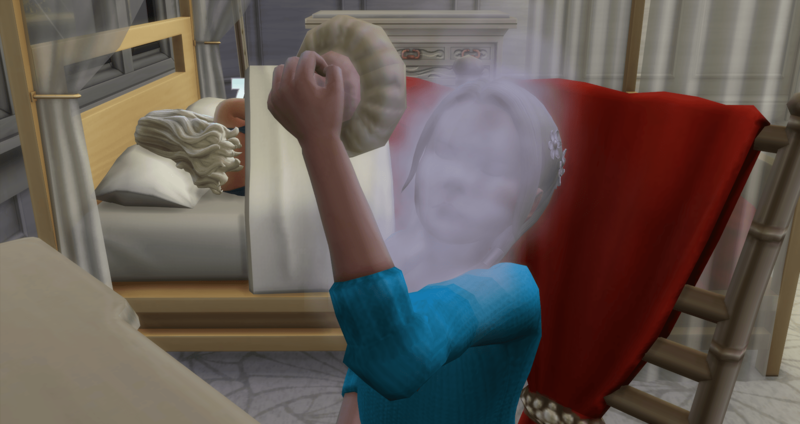 Merry is having more morning sickness with this pregnancy than she has had in the past. 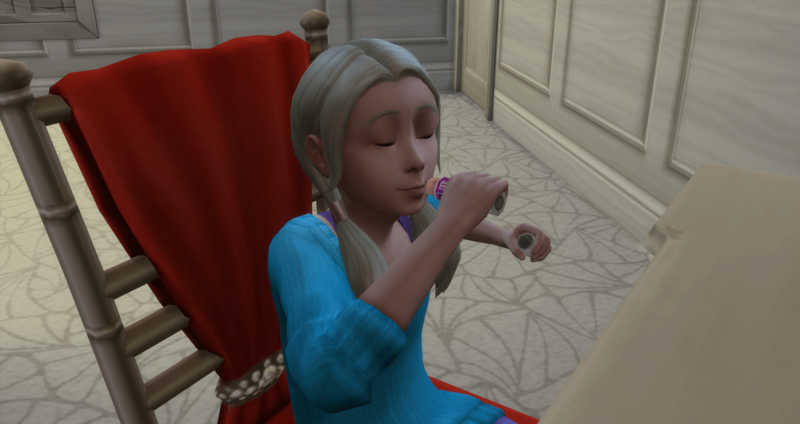 But she has just enough time to throw up before she needs to carry Vienna to the cake. 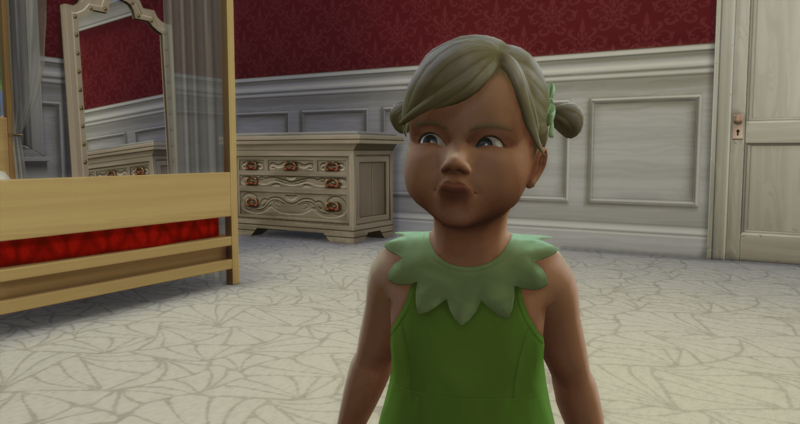 I keep calling it (Vienna) her cheeks, but it is really her jawbones. Pictures coming up of everyone after makeovers. Miami goes first as the oldest of the twins. She adds Snob to Dog Lover (she sounds like she needs a little chihuahua to carry around in a purse). She rolled Jungle Explorer, which really doesn’t sound like it works, except the reward trait it gives her is Treasure Hunter. 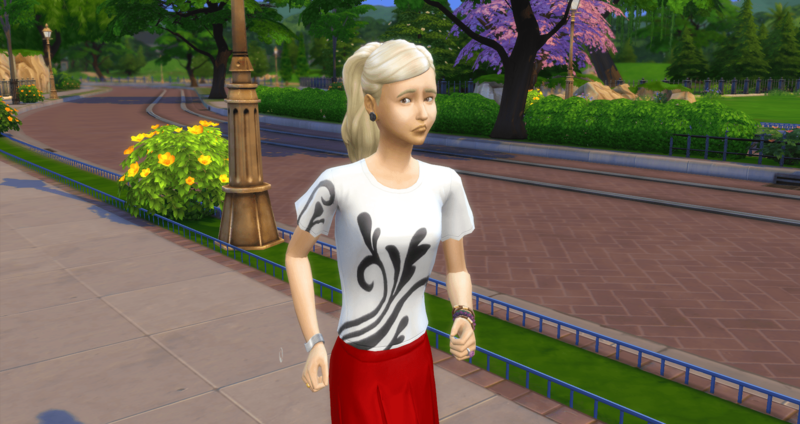 So I thought about suiting her up like Lara Croft – but I didn’t. 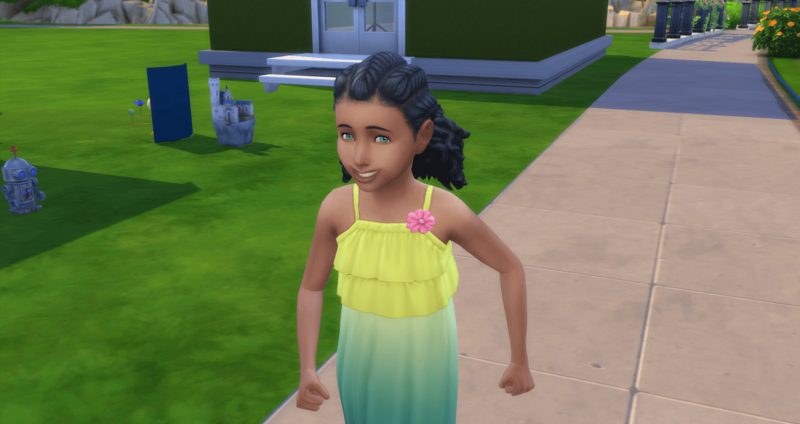 I left her in basically everything she grew into – she only got a few tweaks. Mecca is next. She added Perfectionist to Mean, and rolled Joke Star. Yeah, mean and funny. 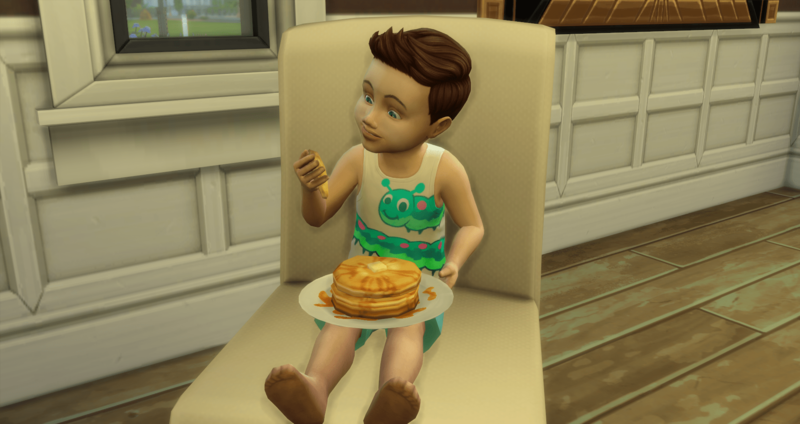 Marcus makes gorgeous kids. Moving on down the line, we come to Vienna. She rolled Insider and Social Butterfly. Those at least work together. Although she won’t be worrying about that aspiration. 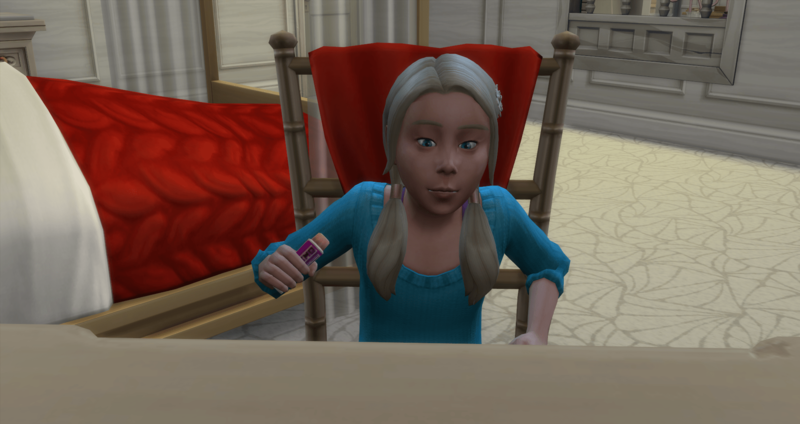 I do believe she got Victor’s mouth. Eyes. Nose. 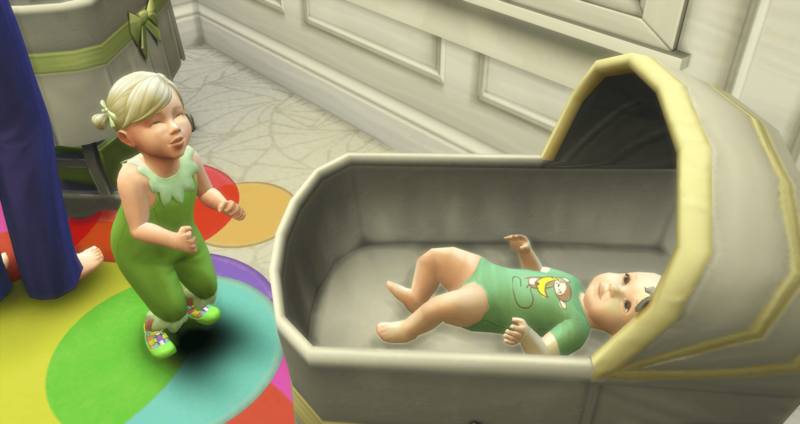 Then, not to be left out, are the youngest twins. First up is Riviera. 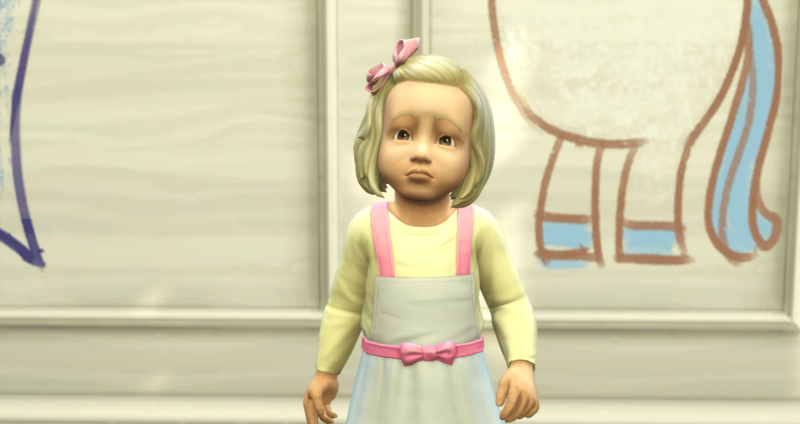 She is our first Angelic toddler. She is basically the same color as the wall. Last, but not least, is Rushmore – a silly boy. 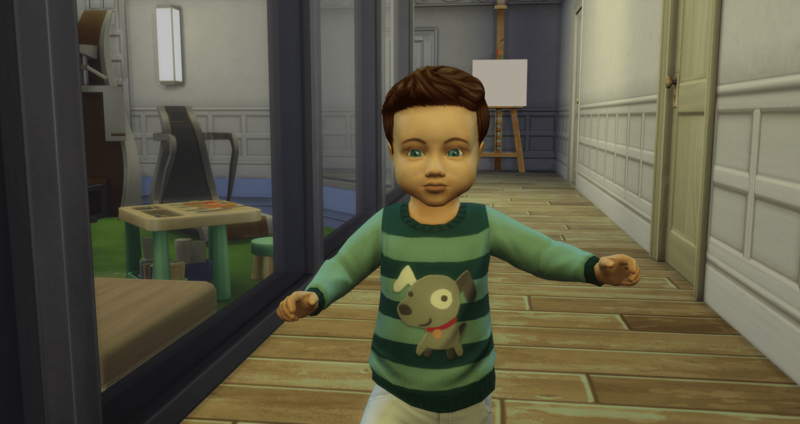 Eleven kids so far, and this is our third boy. 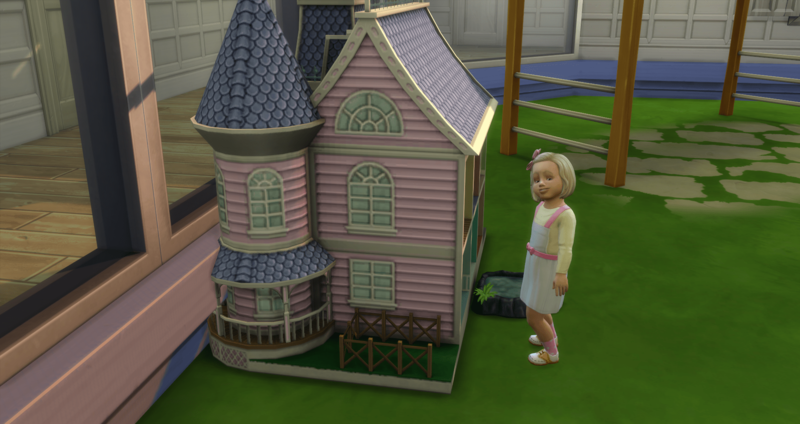 And Riviera starts with the stuffed cat and then moves over to the dollhouse. 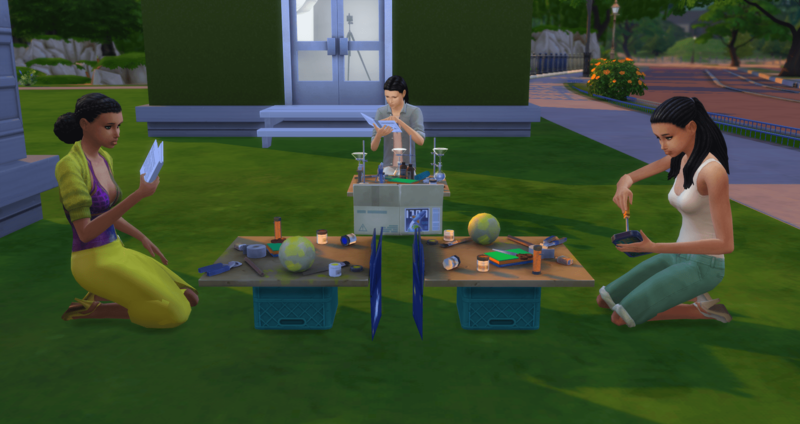 The teens are outside working on school projects (must be Monday). – Merry and Vienna found their beds and are sleeping. Who needs a shower when you have a shower in a bottle. 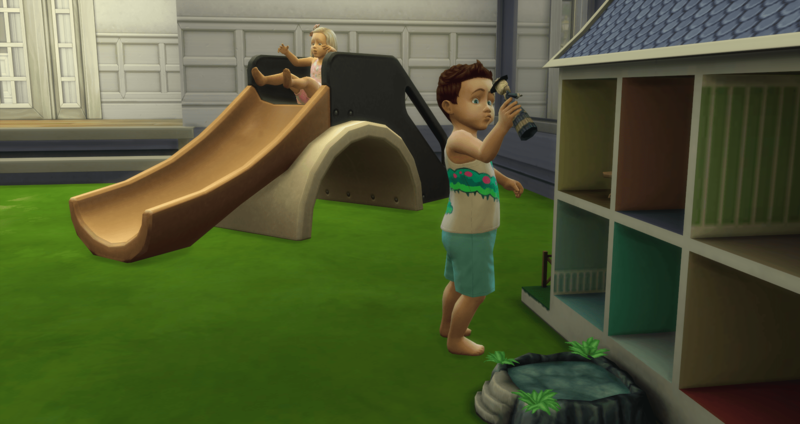 It is Riviera’s turn on the slide and Rushmore is playing with the dolls. There is a thunderstorm outside so they are really sad and scared. The older kids came home from school looking like they had a rough day. Austin didn’t actually go to school and he looks just as bad. Mecca and Miami look like they walked home in the mud. Dammit Riviera – you are standing right outside the bathroom and you had plenty of time to walk in there. And Rushmore is just as bad – he is filling his diaper while he eats. Crying about it now isn’t going to get you clean. I thought they came to Merry to ask for baths. They didn’t. 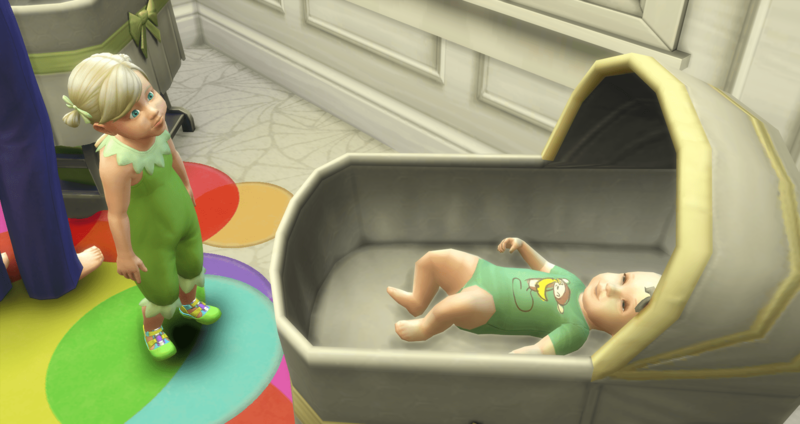 They are both little sad sacks, walking around in green fumes. Such sad little babies. When I checked to see why Rushmore was crying I realized they are having a heatwave and we haven’t turned on the climate control yet. 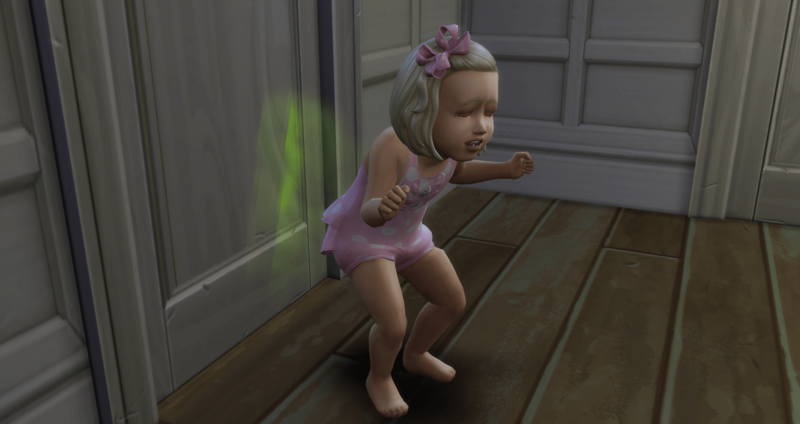 The babies were burning up. Once Merry turned on the climate control, then they started asking for baths. For those playing along at home, that is 9 girls and 3 boys.